From smart buildings to smart cities, the Internet of Things (IoT) is rapidly shaping the way human beings interact with the built environment and various real estate asset classes. Implementing technology into the built environment now allows us to tailor the inhabitant experience and collect and analyze user data to make better decisions for efficiencies and operation. The use of IoT technology is now making its way into the hotel industry. Although it seems to be at the early stages of implementation, it is possible that IoT will reshape future hotel experience. 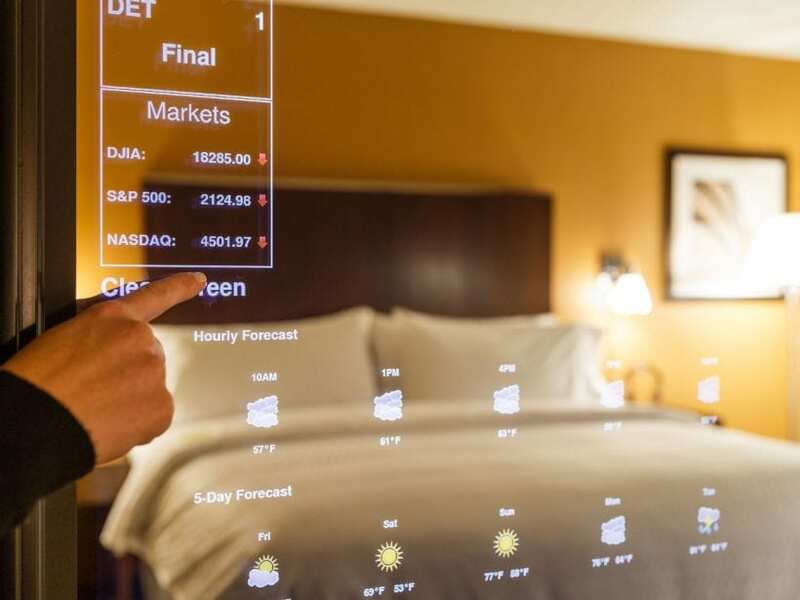 Currently, the United States’ two major hotel brands, Marriott and Hilton, have embarked on missions to interweave smart technology into hotel operations and guest experience. At its headquarters in Bethesda, MD, Marriott has created its Innovation Lab where it is experimenting with various technology. Its IoT Guestroom Lab contains two different guest room models. One of the rooms is used to showcase technologies that may be used in a newly built hotel, whereas the other room is used to show both owners and customers what retrofits can be made to existing hotels for minimal cost and infrastructure changes (Ting, 2017). 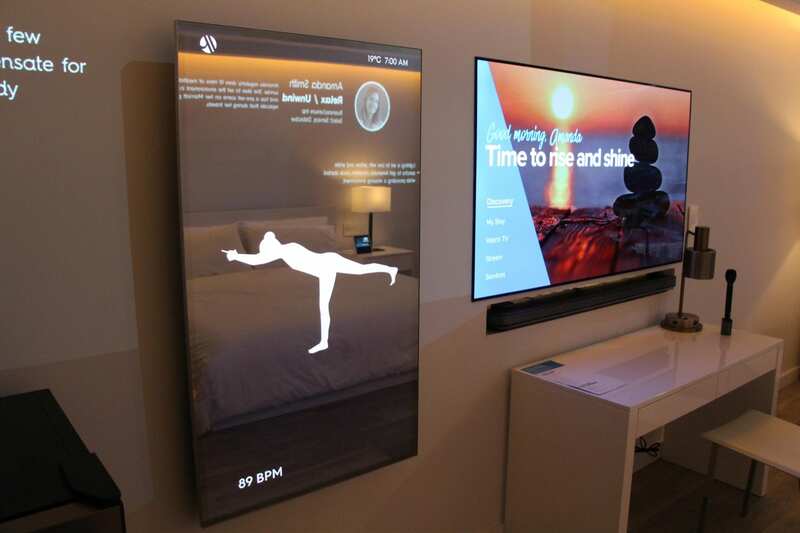 Some of the tech features that Marriott has been testing include a smart mirror, a smart art frame and a smart shower and faucet. In these connected rooms, guests can easily adjust lighting, temperatures, humidity, curtains and artwork, using their voices. Sensor presence technology knows when an individual gets out of bed at night and automatically turns on red nightlights that guide a path to the bathroom. It also knows how many people are in the room and adjusts the amount of oxygen in the room accordingly. Marriott has also partnered with Amazon to roll out Alexa for Hospitality to create a voice-activated experience in rooms similar to experiences that many people are already using in their homes. Currently, the service is only being used on an invitation-only basis at select Westin Hotels & Resorts, St. Regis Hotels & Resorts, Aloft Hotels and Autograph Collection Hotels. Marriott hopes that guests will eventually be able to seamlessly connect their home Amazon accounts to their hotel rooms in order to do things like to stream their favorite music or listen to audiobooks via Audible (Morgan, 2018). Hilton is taking an in-house development approach whereby they are creating their own technologies, most of which can be accessed through the Hilton app. It has been working on its “Connected Room” concept, which it has been beta testing in a handful of hotels. From their smartphones, guests will be able to use the app to control their room’s lighting, temperature controls and entertainment options. Hilton guests are already able to use the app for keyless room entry and check-in and check-out (Ting, 2017). Also, in China, tech giant Alibaba has created an unmanned hotel in Hangzhou, called the Flyzoo Hotel. The hotel is equipped with an artificial-intelligence management system called the “Tmall Genie”. Relying heavily on robots that use facial recognition, Alibaba reps believe the hotel can reduce its labor force by more than half (Hertzfeild, 2018). The robots serve as the receptionist and guide guests by providing recorded voice messages and accompanying them during their stay. IoT features are not only improving the guest room experience, they are also shaping new conference offerings. Hotels are now developing conference rooms equipped with touch screens and video walls to create more interactive experiences. The Fairmont Queen Elizabeth in Montreal has a 180-degree wrap-around video conference room. Some conference rooms are now coming equipped with Apple TV to allow attendees to connect presentations via Airplay. Conference rooms are also being wired to use automated systems that will allow attendees to control various room elements such as projectors, audio, climate and window shades all from a single device. Implementing smart technology in the hotel industry presents a plethora of opportunities and challenges. Connecting guests with smart technology will allow hotel companies to gather more data to better tailor guests’ experiences. At some point, it may possible for the technology to use machine learning to know a specific person’s habits and make predictions. Tailoring guest experience also has the potential to drive brand loyalty as guests will probably be more likely to stay at a hotel that already knows their likes and dislikes. Some smart technologies that improve security, monitor energy usage, and improve certain operational tasks may eventually become commonplace. Increased connectivity does, however, raise some concerns as the industry moves forward. Perhaps the primary concern is that of privacy. Hotels having access to data that resembles how we live in our homes may concern some people. Therefore, the ability of hotel companies to protect this data is paramount. Just recently, Marriott International announced that the private information of up to 500 million guests may have been accessed as part of a breach of its Starwood guest reservation database (Ortiz, 2018). Like many emerging industries, the smart hotel industry will undoubtedly experience some growing pains as new technologies are rolled out. Some may end up being too novel to have staying power. Therefore, hotels will have to grapple with what technologies they keep and which ones they leave in the lab. In spite of this, we will most likely be seeing more technology in our hotel stays in the futures. The opportunity to collect data on guests to create customized experiences is too great for hotel companies not to capitalize on. And although we are now only seeing major brands such as Marriott and Hilton jumping into this arena, other brands should be expected to soon come on board.